My ongoing exploration of Facebook games has recently brought me to City of Wonder's crowded streets. 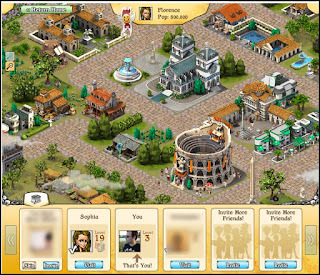 The game's fundamental structure is pretty solid: it's a serviceable version of Civilization that runs in a browser. There's notable history figures, upgrade paths, city management dynamics; pretty much everything you need for this type of game. As is the case with nearly all Facebook games, a tiered energy system limits the amount of action you can take in any given period of time. Of course, you can always circumvent this limit by paying money for more currency or by getting more of your friends to play the game and gift you items. Nothing too groundbreaking. Personally, the most important thing that has come from the experience are some realizations about the current state of platform and technology behind the Facebook game scene itself. Simply put: from a pure technical perspective, City of Wonder is inefficient. Actions that would take one or two clicks on a traditional PC game routinely require double the amount of inputs in a Facebook game. It would be so much faster if I could right-click to get context menus, bulk-select objects by clicking and dragging, or simply use keyboard shortcuts. However, because of the limitations of the browser and the programming language of most Facebook games (usually flash) this just isn't possible right now. I don't know much about flash, but I imagine that these problems will be solved some day and Facebook games will get more efficient and capable of handling complex actions. But let's just put on our tinfoil hats for a minute: do Facebook and the companies invested in making Facebook games have any incentive to make these games more efficient? 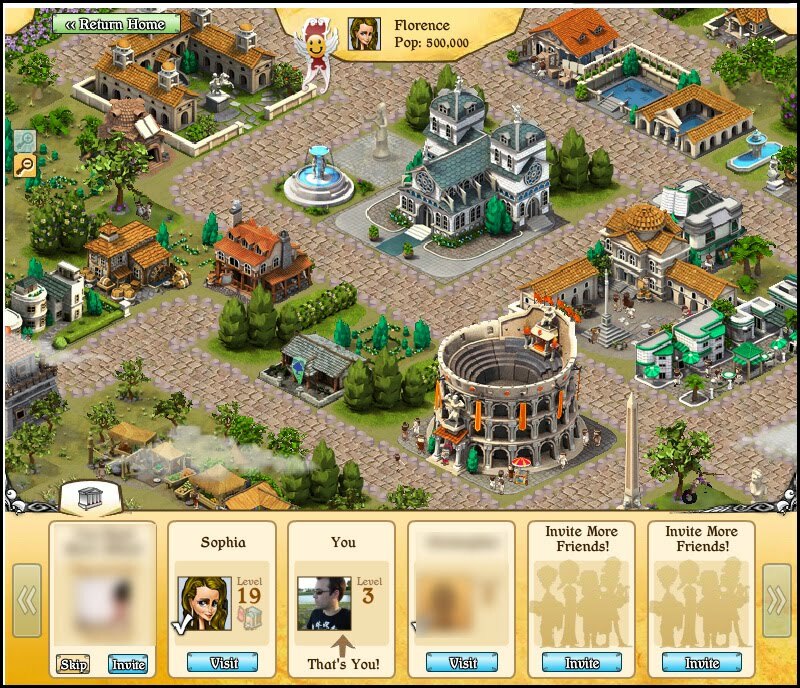 Inefficiency and clunky interfaces are integral to many Facebook games. The point of microtransactions in games like City of Wonder, Dragon Age, or Ravenwood Fair is to give you a chance to pay your way out of having to slog through tedious actions and wait times. For those who aren't paying for more actions, including large amounts of busy work and ponderous menus extends the amount of productive playtime. Since I don't buy things in Facebook games, the single-click/single-action model still ensures I spend a minimum amount of time in the game. With some more intelligent mouse input and a few keyboard macros, I could probably burn through all my Facebook gaming in a half the time it usually takes me. Once I did that, I would just quit playing, which is exactly what game developers want to avoid. Now I won't go so far as to claim there is some kind of organized conspiracy to keep flash simplistic and Facebook gaming clunky, but I can't help but think that the technology and the monetization models seen in some of the most popular games has had a large influence on Facebook game design. Facebook games let you pay to cut through the tedious stuff, so what impetus is there to remove said tedium? So how can we create meaningful game experiences on a platform largely defined by the inclusion of meaningless action? I don't have the answer yet, but I'm working on it. For now, I'll just say that it's a tricky problem created by the confluence of technology, game design, and economics. It's also an exciting problem, and its novelty continues to draw talented designers (including Sid Meier himself) to the community. Given enough time and innovation, I hope we'll be able to build something more greater than a city of clicks. I think you're right. Although, having not played the game, I can only speculate on the problem. It's easier, for both developer and user, if the same grammar is used from game to game too. If the average play-time is short (say, for example, anywhere from 30 seconds to 5 minutes) then those five-to-seven clicks are "worth their time" to the user and, even if they aren't, they can pay for more 'time' -- and thus the developer gets money. If you know about other ways to play, other grammars, it probably seems very odd to see this though. Why not, as you said, use a "right-click... context menu"? I can answer that too actually. So, and I'm not saying they did this, if they wanted to keep users in the system as long as possible and avoid inputs that most users don't think about, it makes sense to make it take multiple left-clicks. Which to say that you might be right about it being a conspiracy on some level, just (probably) not an overtly evil one -- it's more a confluence of problems. That's pretty interesting about Flash and input capturing. I have played so many other, non-Facebook, Flash games that have used the same single-click interaction method, I just figured it was some sort of hard rule in the language. Thanks for the insight!